French | personal.amy-wong.com - A Blog by Amy Wong. You know, for a year when I didn’t watch that many movies, I’m doing pretty good. LOL Confession! I haven’t been following award season, it does feel like it’s my second or third year already. I do know that people have been freaking out because all critic guilds and industry guilds have been awarding all different movies. As the saying goes~ todos parecen más perdidos que cuy en tómbola! Here’s my Spirit Award one. 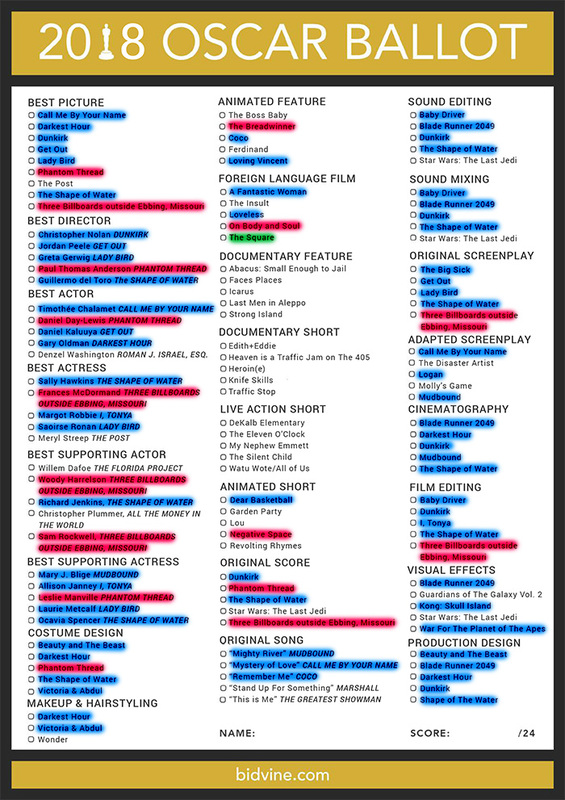 Light blue highlights mean watched, hot pink are pending, and green on the queue already. My favorite competing film this year (so far) is Lady Bird coz it got me in the feels. I wouldn’t mind The Shape of Water winning, though. Considering BAFTA nominations (Producers’ Guild win and Directors’ Guild nom), The Shape of Water does seem to have a love more momentum than actors-backed Three Billboards, and this one also has a strong BAFTA showing. Fun fact, yo! Darkest Hour, Phantom Thread and Victoria & Abdul are [most likely] the first Chinese-backed films that make it to Oscar. All backed by Perfect World Pictures (北京完美影视传媒) . What do Mamamoo and Chulpan Khamatova have in common? They all came together in a weird dream I had last night— now, the details are getting murkier, but I was walking down the street of the house where I used to live, which magically turned (I’m supposing) into some street/random place in Russia where I met Chulpan. What makes it all the more weird is that I haven’t seen Chulpan-related movies or series lately. Suddenly we were at some high building which feature, I suppose, an incredible view of the city. It felt like we talked a lot in English… and French. I don’t even think Khamatova speaks French xD Mamamoo comes up over the fact that I, for some reason, tell Chulpan about Mamamoo. LOL AND Bryan Cranston comes up because he somehow got mad over the fact that I was talking to Chulpan about them. Hahahahaha. The dream made so little sense that the moment I woke up, I did so laughing.